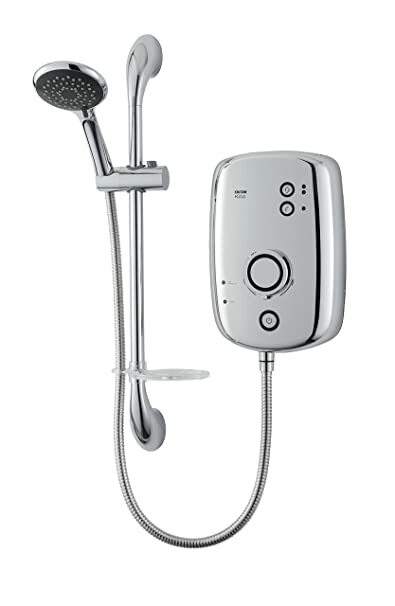 Whenever it comes to electric showers, the Triton Kito is one of the common products that most of the sources suggest. In case if you are too planning to get the electric shower for yourself and looking for a quick Triton Kito review, then read on. There is no doubt that this one is one of the sleekest yet modern looking electric shower available in the market. Even what makes it more awesome is the pricing of it. It is extremely affordable and enhances the look of any bathroom. In addition to that, it comes with lots of amazing features. Check Best Electric Shower you can buy right now for a decent bath experience. However, to give you a better idea, let’s just go ahead and talk about the Triton Kito review. Triton Kito is one of the best electric showers available in the market. It comes with options which are the 10.5kw and 9.5kw. Also, the design of the electric shower is extremely elegant and makes you fall in love with it. However, if we talk about the features, well the Triton Kito electric shower comes with a push button for the start and stop functions. It also retains your preferred power and temperature settings. You also get a dial temperature control with the electric shower. This helps you to set your preferred method very quickly. To ensure that the electric shower is offering excellent performance. It has a low-pressure indicator. As a result, whenever the water pressure is low, the warning LED lights up. Moreover, you will get push-button power settings. As a result, you can easily select your power settings between cold, eco and high. The electric shower also comes with the phased shutdown feature. As a result, whenever the shower is turned off the water keeps running for a few seconds and flushes out the preheater water before it gets stopped entirely. Hence you get to experience a safe interaction with the electric shower. It even comes with 5 different shower head spray patterns. Each shower pattern offers individual showering experience. Plus it provides you with a spa-like feel. In addition to that, you will get luxury all chrome kit with clear soap dish. Also, the best part of this electric shower is that you will get two years of warranty. Triton Kito is one of the most high-end electric showers from the manufacturer. It sports a sleek and all chrome design and has lots of convenient features which allows you to get a pleasurable showering experience. The push button helps you to switch and off the electric showers within seconds. Also, the temperature control allows you to set the perfect temperature. All you have to do is rotate the dial and select the temperature that you like. This even allows multiple people to set multiple water temperature. In addition to that, you are getting three different power setting. These power settings are the cold, eco and high. Also in order to make your showering experience as same as a spat, it comes with 5 spray patterns. These 5 patterns are the jet, spray, blast, rain and drench. As you are already aware of the fact that the low water pressure affects performance. Hence, as a result, there is a warning LED indicator embedded in the electric shower. The LED indicator lights up whenever the water pressure falls down. So you can take instant action. In addition to that, you get a phased shutdown feature. This feature helps in preventing limescale. As a result, it becomes safe for the next person who is going to take a shower. As the electric shower flushes out all the preheat water before turning off. This does not just ensures safety but also adds a few extra years to the electric shower’s life circle. Now let’s just have a quick look at some of the top pros and cons of the Triton Kito. It comes with simple to use push buttons for power controls. Triton Kito has an easy to use temperature dial. For safety metrics, it has the phased shutdown feature which prevents limescale buildup. The electric shower comes with the slimline technology which helped it to get a compact design. It comes with 5 spray patterns so you can get a luxurious showering experience. Amazing design and offers durability. So that was all for the Triton Kito review. Overall the electric shower is pretty great and offers with quite a lot of features. However, the only setback is the no temperature cut-off. But this is a feature that many electric showers does not have. Even if we judge the electric shower from its price point, it is quite justified. Anyway, go ahead and check out this electric shower and see if it meets your needs or not.